You might want to let your viewers of your nice web site know that on 10133.56kHz AA0RQ/b is on the air…30mw at night and 100mw during the day and solar powered. Thanks for the suggestion, Bill! I would also encourage you to visit the QRZ.com page of William (AA0RQ). There, he describes in good detail, the beacon, how to get a QSL and figure the miles per watt to your QTH. I also enjoyed reading his bio and how he fell in love with low power. Now I’m off to snag AA0RQ/B! 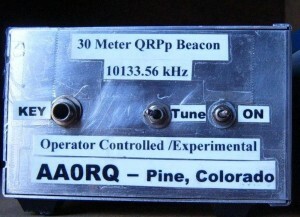 This entry was posted in QRP, QRPers and tagged AA0RQ, AA0RQ/B, CW, QRP, QRP Beacons. Bookmark the permalink.